We learn the name Hayley Paige before we learn what a bustle or hem is… That’s because bridal designer Hayley Paige has turned the world of bridal fashion on its head with her sprightly, pastel, glittering re-imaginations of the wedding gown. 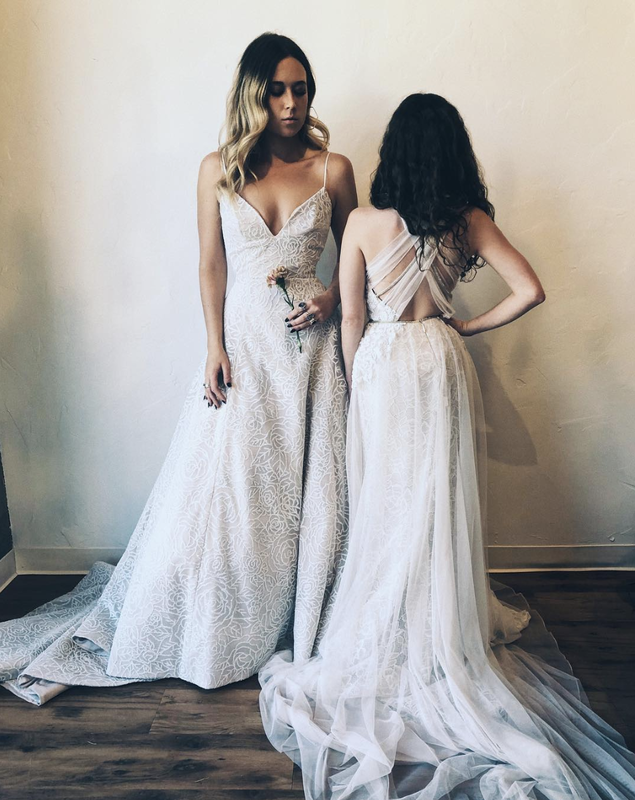 Famous for her cameos in TLC show “Say Yes to the Dress,” Hayley Paige is a Kleinfeld designer that also happens to be exclusive to anna bé in Colorado! We are the only boutique bridal salon in the state that is home to both Hayley Paige runway and BLUSH by Hayley Paige… and we’re pinching ourselves with excitement! Raised a Cali girl, Paige’s first adventure in fashion was an internship with Nina Garcia at Elle Magazine during her collegiate years at Cornell University. No surprise, Paige celebrated graduation with a stunning 10-piece bridal collection. Next on her path was a position with Jill Stuart, followed by extensive travel through Europe where her creativity caught fire! Today the magical whirlwind of a Hayley Paige design incorporates sashes of sass, transcendental beauty, chic glam, and playful confidence. She has a smile that lights up the room! In October 2018, anna bé welcomed BLUSH by Hayley Paige into our bridal salon. Much like the Hayley Paige collection, BLUSH is led by Miss Hayley Paige and noticeable for its casual elegance and femininity. Expect never-before-seen laces, whimsical soft tulles, and delicate tones of blush (obviously! ), ivory, and tope. Romantic is the first word that comes to mind when seeing a BLUSH gown… however anna bé brides rock BLUSH from the classic cathedral church to the wild mountainsides, the beach, the ballroom, and everywhere in between! A BLUSH is what you make it, and elevates any backdrop. Follow anna be’s Instagram account for sneak peeks of our most beloved BLUSH gowns on real brides. And of course… we’re getting new styles too! At New York Bridal Fashion Week, anna bé was in the front row hand-selecting the newest BLUSH gowns to bring to our brides. It can take a while for dresses to get to the salons hot off the runway, but good news… we’re getting more BLUSH styles for anna bé brides in celebration of our HAYLEY PAIGE TRUNK SHOW.